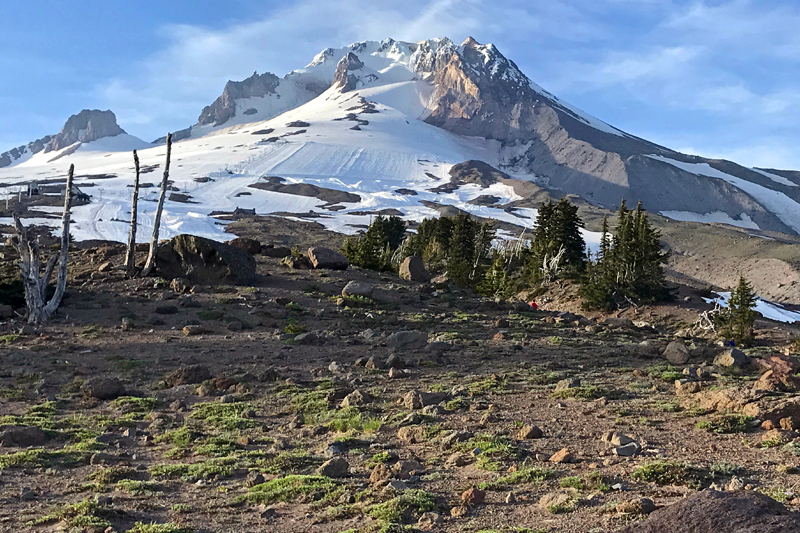 With summer now in full swing, the warm and sunny weather continues to improve conditions on the PCT in Oregon. This has opened up much of the far southern portion of the state, as well as most of the low- to mid-elevation regions thru the remaining areas. 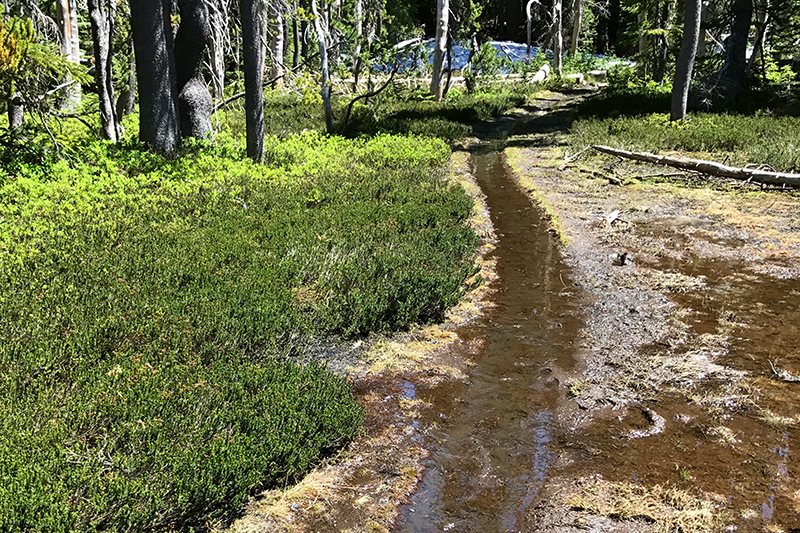 Hikers are happily reporting that summer wildflowers are going gangbusters and there’s plenty of water in swollen springs, creeks and lakes. The higher elevations and central wilderness areas, however, continue to stymie hikers with the lingering snow cover and excessive blowdown. A few trail crews have recently gotten into lower portions of the Three Sisters and Mt. Jefferson wilderness areas to open up some stretches, but there’s still lots to clear. And mosquitoes are at horror-movie massacre levels right now. Be prepared! SOUTHERN OREGON (Secs. 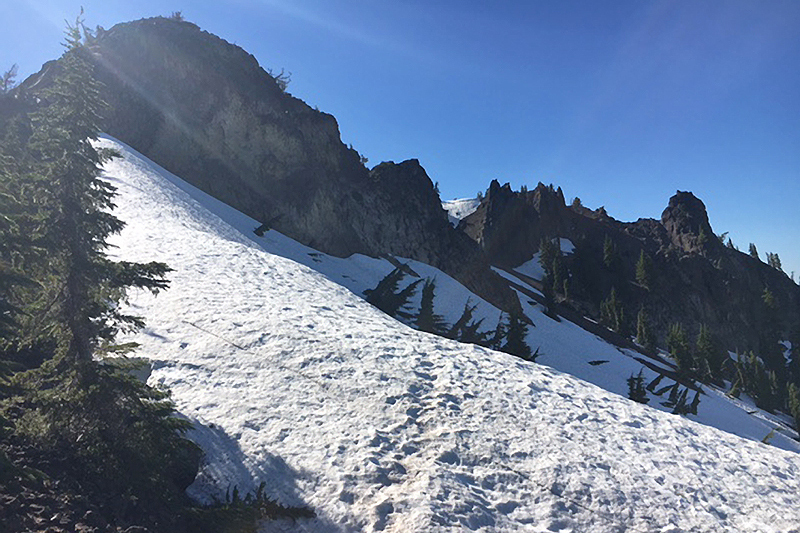 1/2, R/B) – The Siskiyou Mountains are now almost completely melted out, with just very spotty snow between Donomore Pass and Fish Lake. The way forward into the Sky Lakes Wilderness is clear of snow until just south of Devils Peak, but expect lots of blowdown and mosquitoes. From Devils Peak—which recent hikers have indicated is very sketchy going down the north slope (see photo)—the way into Crater Lake Nat’l Park is still mostly snow-covered, as is the Rim Trail in the park. Hikers are reporting walking the Rim Road as an alternate. North of the rim, the way thru the Pumice Desert is clear to OR-138. WATER NOTE: Based on your reports, we have contacted the Rogue–Siskiyou Nat’l Forest and informed them that the handle on the well at Brown Mtn Shelter is missing. They will be looking into fixing that. We’ll keep you updated. CENTRAL OREGON (Secs. 3/4, C/D/E) – The few reports coming from the central area continue to indicate lots of snow, blowdown and challenges. Many hikers are jumping ahead to Willamette Pass, or detouring onto the Oregon Skyline Trail to avoid the difficulties with the Mt. Thielsen and Diamond Peak wilderness areas (see note below). From Willamette Pass, there are several miles of clear trail, but the bugs are terrible! Expect spotty snow thru the Cascade Lakes region and more up into the Three Sisters area. The trail between McKenzie Pass and Santiam Pass is mostly clear, with the exception of the forested sections around Mt. Washington. SHUTTLE ASSIST: Diamond Lake Resort (just north of Crater Lake Nat’l Park) is offering PCT hikers free shuttle service between the North Crater TH and the resort, and between the resort and Windigo Pass. At Windigo Pass, hikers can detour onto the Oregon Skyline Trail to bypass the snow-covered Diamond Peak area. North Crater pickups are at 10am and 2pm; Windigo Pass service is available upon request. Call 541-793-3333, ext. 1, to request service. NORTHERN OREGON (Secs. 5/6, E/F/G) – Thru this section, exposed portions of trail are clearing nicely, but the closed-in forested areas continue to hold lots of snow and debris, making navigation extremely difficult. From Santiam Pass, the snowline continues to hold out just south of Three-Fingered Jack and continues thru the Mt. Jefferson Wilderness to Olallie Lake. The trail thru the Warm Springs Reservation area is clear to Barlow Pass, but forested snow returns up to Timberline Lodge. The trail around Mt. Hood is spotty in sections, but remains under snow in forested areas. The Zigzag and Sandy rivers are running very high and hazardous; use extreme caution. Patchy snow and blowdown remains between Lolo Pass and the Benson Plateau. As of 7/5, the Eagle Creek alternate route is closed (see below). It’s not the Sierras. This is right here in Oregon—the north slope of Devils Peak. Photo by Marci Hanson. Got PCT conditions info to share? Send us an update! SECTION 6 (G) – The Indian Creek Fire has closed the Eagle Creek alternate north of Indian Springs and Wahtum Lake. The closure area (see map) includes the upper Eagle Creek Trail, between Wy’East Camp and the PCT, Indian Springs Trail, Eagle Benson Trail and the eastern portion of the Eagle Tanner Trail. The PCT and Wahtum Lake remain open. PCT hikers should stick with the official route over the Benson Plateau. Visit Columbia River Gorge NSA for more info. 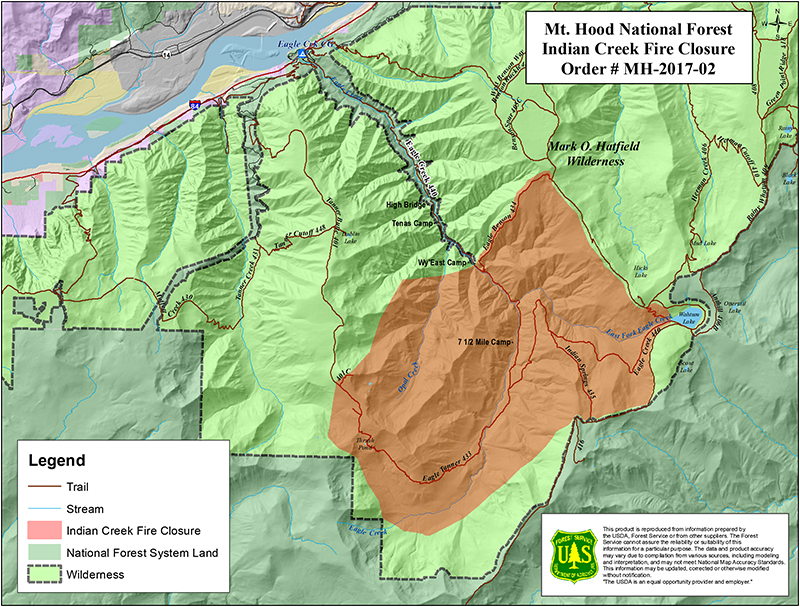 Indian Creek Fire closure area, including the upper Eagle Creek Trail. Map courtesy of USFS. The weather across Oregon’s Crest is forecast to remain pleasant and mild thru the week. Expect lots of sun, with a few clouds here and there. Statewide, daytime temps will be comfortable in the high 60s and low 70s thru most areas; it will be a little cooler in the Diamond Peak and Mt. Hood regions, and a little warmer in the McKenzie Pass region. Overnight temps will hover mostly in the high 50s. Temps will warm a few degrees across all areas heading into the weekend. The Gorge will continue being the warmest area, with temps in the high 70s to high 80s. Click on the locations below for local forecasts. There is still plenty of snow in the upper reaches of Oregon’s big peaks. Rapidly warming temps can lubricate snowfields and send them sliding down hillsides. If you’re planning to hike near snowy peaks or high passes, check for avalanche warnings before heading out. 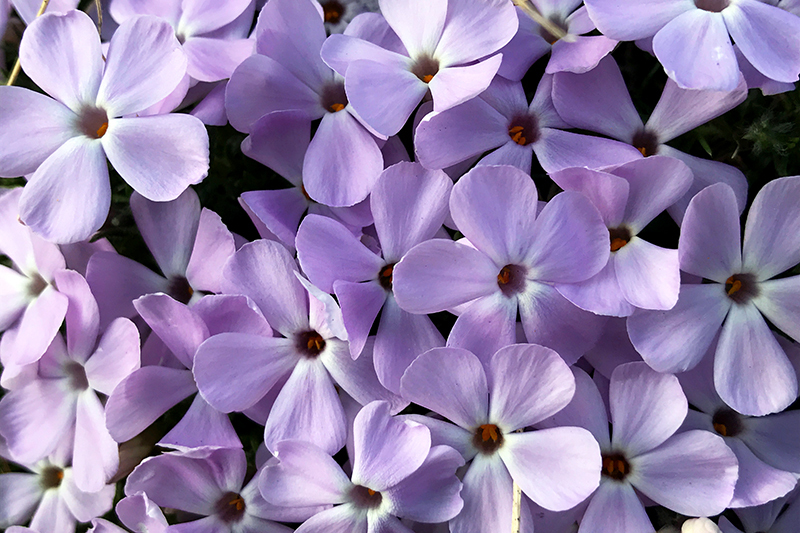 Wildflowers, such as this Spreading Phlox, are painting the PCT with summer color. Photo by Eli Boschetto. All highways and secondary roads accessing the PCT’s primary trailheads are open and clear. • Crater Lake National Park – All park roads are open, with the exception of East Rim Drive, between the Steel Visitor Center and Skell Head (southeast section), which remains closed due to snow. All park facilities are open. • Cascade Lakes Scenic Byway (OR-46) – Road is open and trailheads are clear. • McKenzie Pass Hwy (OR-242) – Road is open and trailheads are clear; Lava Camp Lake is open. Thanks to PCT hikers Erin, Marci, Mark and Bright for their trail reports! Have you been out on the PCT in Oregon and have trail info to share? Send us an email with your update and a photo and we’ll get your news in the next report. Your fellow hikers will thank you! Main photo: Signs of Summer on Mt. Hood, from the PCT at Timberline Lodge. Photo by Eli Boschetto.